You can probably guess from the cover what this book is about. And it's from Severed Press which usually means monsters! in the case of Oceans Hammer we are talking a giant hammerhead shark! It's a balls to the wall pulpy action deep sea romp that is thoroughly entertaining. If you are a fan of this publishers other creature feature books then this one will not disappoint. 4 stars from this reader. Lately, I've been reading a fair number of deep-sea adventure novels by Independent authors and, frankly, I've been disappointed by many of them.Too often the characters are one-dimensional, the plots thin, the narratives shaky and the action scenes are more suited to Saturday morning cartoons than a novel. 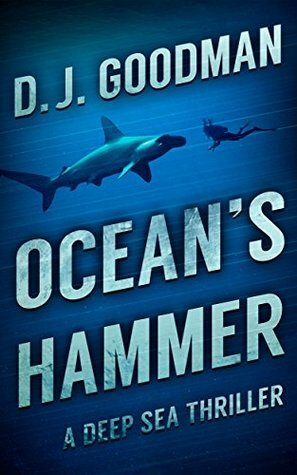 "Ocean's Hammer" is, however, not at all like that.It is, instead, fast-paced, has original (and well-developed) characters, an interesting plot, highlights some key social and environmental issues in the flow of the smoothly written narrative and author D.J. Goodman clearly knows a lot about the subject she's writing about.The novel revolves around efforts by environmentalists to peacefully stop illegal shark fishing in the Sea of Cortez. They set out to block the entrance to a marine preserve one morning but it's not long before things go wrong.And not just wrong but "bad wrong," as a friend of mine from Texas is prone to say.It's not my intention, however, to discuss the plot of this really fine novel in detail because that would be unfair to readers and to the writer. I will say that it does have some really interesting twists and turns that make reading this book even more enjoyable.Instead of detailing the plot, I will say that I found the characters in this book fascinating, especially the leader of the environmentalists and his assistant/lover. They are unique in this genre, and to my way of thinking that's a very good thing. The secondary characters are also nicely fleshed out and behave in a logical way. By that I mean that none of the secondary characters suddenly turn out to be ex-Navy SEALS who save the day with awesome combat skills or some other such foolishness. (I mention that because I've read a few books recently in which the mild-mannered deck hand turns out to be just that... not very believable. )In addition I found Goodman's gentle jabs at mainstream media and Independent publishing not only amusing but also spot on.Finally, I very much enjoyed the way Goodman handled the action sequences in the book. I spent a couple of tours of duty in the Mekong Delta when I was a young rifleman in the 9th Infantry Division and later an advisor to a Vietnamese infantry regiment and I spent a good share of my career as a journalist covering disasters - both natural and man-made. Goodman's descriptions of the way people act and react when faced with extreme danger was on the money, at least from my experience. That's a refreshing change from the way many authors treat their characters when they come up against something terrifying.To sum up, this is a really good read and a book I have no hesitation in recommending. Let me start off by saying that I love a book the tries to break the 4th wall. Read it to find out exactly what I mean. This now bring me to my review. This book is brilliant. Plain and simple. Plenty of humor that goes right in to fantastic attack scenes. There are characters that you truly care for, along with one of the most bizarre creatures (a giant hammerhead shark) with a singular intelligence. I highly recommend this book to everyone who loves a good deep sea thriller. You will come back for more. Hammer timeThis was an inventive, adventurous read. Well done narrative painted vivid storyline, which in turn, made all the action more believable. Looking forward to the continued story. It was a good sea yarn that held my attention. The plot was unusual. The characters were mostly developed. The action was fast. Fast paced fun read. Ending kind of fizzled.